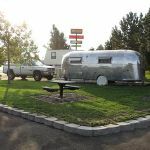 Ask fellow campers about "Pilot RV Park" and nearby attractions. 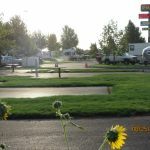 The Pilot RV Park, in Stanfield, Oregon, is right next to a big Pilot truck stop, like you might have seen regularly if you drive the interstates. I don't know whether the Pilot Corporation is looking to expand into the campground business, or whether a local campground owner was looking to take advantage of the Pilot brand. In any case there was good news and bad news. The good news was that on that last night of my trip, when I was only going to stay for that one night, having shelter, fuel, and food I didn't have to cook there, all conveniently in one place, made things easy. The bad news was that it was LOUD! Trucks were coming and going all night long. We camped at Pilot RV Park in a Fifth Wheel. We stayed here for one night on our way to Nevada. Very convenient off I84, level sites, 50 amp, sewer and no problems at all with Verizon or satellite service. There's very well manacured grass areas between all sites. All roads and sites are paved and easy to manuever in our 40 ft rig with a tow. If there was a downside, there's a Pilot truck stop agacent to the park which can create some noise. The noise didn't bother us and filling up with diesel in the morning will be a breeze. We camped at Pilot RV Park in a Motorhome. Have to say I was dubious to stay behind a Pilot gas station. But, this park was very nice. Well maintained. Grassy spaces b/n sites. Easy maneuvering around the park and easy parking. The manager was very helpful by guiding us to our parking space. Our site was level. Spaces are well thought out. There was highway noise but we sleep with a fan on so the noise wasn't a problem for us. When entering the station, look to the left of the McDonalds for the sign guiding you to the park. We'll stay here again the next time we come this way. We camped at Pilot RV Park in a Travel Trailer. We were very happy to have found this park as an overnight stay. The managers were courteous, responsive and went out of their way to ensure our stay met expectations. The grounds were meticulous, nice grass between sites and everything was very well maintained. Yes...Located directly behind the Pilot station and not far from Hwy 84. Earplugs helped us get a great night of rest, we felt very safe and will return in a heartbeat the next time we pass through. We camped at Pilot RV Park in a Motorhome. There appears to be only a few rv spots that are for overnighters. It is clean here but very very noisy. We will not stay here again. We camped at Pilot RV Park in a Motorhome. Not much to say for this very tidy, right off the highway over night stop over. Everything worked well. Good Sams discount. Very tidy with well established grass. We were traveling between Washington State (Anacortes) and back east. This was our first stop over going along 90 to 82 to 84. This is the first town on 84 basically and a good stoping point. I tried to call during the day and never got anyone but as it was during the week (even in the summer) I decided to give it a try because it was very close to the highway and if it was full, we could keep going to Pendelton. So you basically go to the Pilot and look carefully for the sign to the RV park after you turn into the gas pump areas. Wind your way through the truck parking and you will come to a lovely shaded park. The first three spaces and some throughout the park are open. Pick one and put your money in the slot after you are set up. The full time people there are very very nice and will have a cocktail with you if you like. A little oasis behind the pilot. There is a bit of noise from the highway and gas station but it is background noise. Great place to over night if you find yourself here. Cable is good, utilities are good. Loved the park. We didn't unhook but there is only a Submway and McDonalds next to the pilot so don't expect much. We camped at Pilot RV Park in a Fifth Wheel. Nothing to do but there is a good farm to table restaurant in Hermistone (sp?). Ten minutes down the road is Walkers Farm Kitchen. 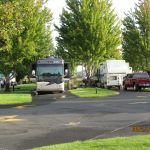 Would NOT recommend this RV park for anything but an overnight stay,or maybe a week,unless you like hearing semi trucks and their engine brakes all night long.The park is very close to a truck stop and interstate so loud noise is the norm,day and night..plus there is a railroad track nearby with loud trains all night. We camped at Pilot RV Park in a Fifth Wheel. Nothing much in Stanfield. Hermiston is down the road and Tri-Cities an hour away with major shopping. Pulled in after fueling up at the diesel pumps, booked for 2 nites and then one more. One of the cleanest parks we've seen for awhile. We parked in space 1 which is right next to semi overnite parking. Noise really didn't bother us. Loved the grass between sites and it's kept neatly trimmed. Each site has a really nice picnic table on cement and a chain link fence with slats to give you privacy from the next site. Will stay here when ever in the area. Management was really friendly. We camped at Pilot RV Park in a Motorhome. McDonalds and subway are walking distance at truck stop. Down 395 is a Denny's and as expected excellent food. Used as a stopover on a longer trip. A bit of an unusual park as it is attached to a Pilot Truck stop. Park is in the back of the truck stop. Check in is all self service - find a spot and park then put payment in an envelope and insert in lock box. There are staff around. I called the park manager at the number on the billboard to get WiFi code and restroom combos. Lots of trucks idling in the lot next to the park but it really didn't bother us. Our pull through was easy to negotiate but some may have been challenging b/o trees and narrow roads. Overall a pleasant stopping place with groceries, McDonalds, Subway etc a walk across parking lot. Would stay here again. We camped at Pilot RV Park in a Motorhome. Easy access to I-84, paved and level sites with a little grass strip. Park was clean and sits next to a Pilot truck stop. A good place to stop for the night. We stayed in a 42-footer. 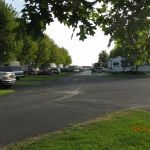 We camped at Pilot RV Park in a Fifth Wheel. The park is close to the highway so there is some noise, but not bothersome. McDonald's and Subway are within walking distance and the gas station here has competitive prices. Lots of green grass and shade trees. Sites are paved with a table and full hookups, including cable. Have stayed here before and will again. We camped at Pilot RV Park in a Motorhome. This was a 'surprise to find' campground for us. We fueled up here and were beginning to think about where to spend the night. We saw this park right behind the Pilot so decided to check it out. 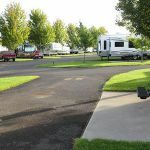 The RV park is very nice, campground hosts are very pleasant and helpful, so definitely was convenient for an overnight stop. Rate reflects Good Sam discount. The park is relatively full of permanents and the campground host told us there is quite a bit of construction going on in the area so that's why it's busier than normal, however, they keep their sites neat and clean. The park also saves about 8-10 sites per night for 'overnighters' and it was full the next a.m. when we left. The downside to the park is the overnight semi trucks next door, however, it wasn't a problem for us. Will definitely stay here again if in the area. We camped at Pilot RV Park in a Motorhome. A little noisy being next to the Pilot truck stop but we were able to sleep, so not a big deal. We liked it well enough to stay on our return trip. A good overnight spot but not a destination. A lot of long term rigs but still spaces available. We camped at Pilot RV Park in a Fifth Wheel. A good stop while traveling on Hwy 84. It is right behind the Pilot station. It can be a little noisily during the day; but we found it quiet after 9 PM and slept good.. We camped at Pilot RV Park in a Motorhome. Are you affiliated with Pilot RV Park ?